The news on how commotion reigned supreme at the National Assembly as a plot to stop the Speaker of the House of Reps, Aminu Tambuwal, from entering the assembly complex failed due to the resistance of the security forces by lawmakers on Thursday. 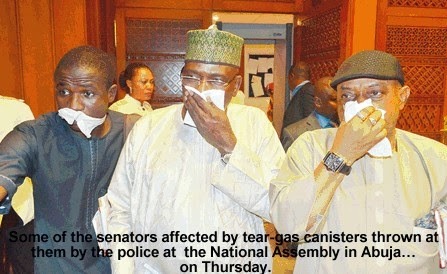 Riot policemen tear-gassed angry lawmakers, who were protesting against the development. 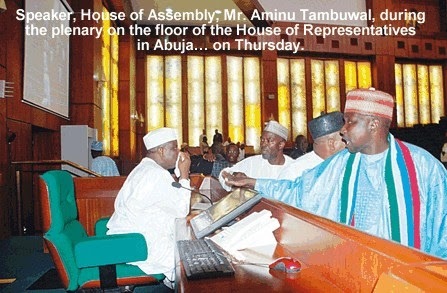 Although the general belief was that the security operatives were deployed in the assembly to prevent Tambuwal from presiding over Thursday’s “special plenary,” but PUNCH has just gathered that it was actually to stop some lawmakers, especially those in the APC Caucus, from tabling a motion for President Goodluck Jonathan’s impeachment. The drama started as early as 6am when heavily armed policemen and hooded SSS operatives blocked all the gates to the National Assembly. Back at the main entrance gate, they conducted searches on vehicles of Senators, House members, workers and visitors to the complex, all in a bid to stop the speaker from entering the premises. Tambuwal himself had arrived around 10.47am to meet the blockade. He managed to pass through the first gate after the security personnel asked for his identification. But, on reaching the main entrance gate, he was stopped by the policemen who were led by a top officer from the Federal Capital Territory Police Command. Angered by the police action, many lawmakers in the speaker’s company became agitated and demanded explanations from the police. After about an hour, the speaker was sneaked in through a side gate. But the gate remained shut against all others, some PDP and majority APC members. This further infuriated the lawmakers, who began to shake the gate violently in a move to pull it down. When the realised it would be a Herculean task, they resorted to scaling the gate to the main complex. When the policemen realised that locking the gate yielded no results, they started throwing tear gas canisters at the lawmakers, including Speaker Tambuwal. Twice, canisters landed right in front of the Speaker as he walked, shielded by his colleagues to the entrance of the lobby. At the lobby, the enraged lawmakers, practically pulled its doors down as they forcibly guarded Tambuwal into the House for proceedings to begin. They chanted, “Make way for the Speaker, make way for the Speaker,” as police threw more tear gas canisters on the Speaker right inside the lobby. Many people ran for their lives, struggling to breathe. Earlier, the Senate President David Mark and many senators had been stopped for about 30 minutes at the Presidential Gate to the National Assembly before being allowed to enter the complex. When Mark heard that the speaker had entered, he went to the House to discuss with him in what appeared like a show of solidarity. 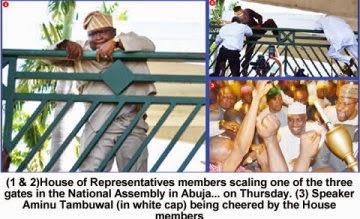 But, his entry into the House chambers infuriated many APC lawmakers, who asked him to leave. The lawmakers harassed David Mark, accusing him of being part of the conspiracy to stop the speaker from presiding over the House. One member, Abdulmalik Cheche, held him by the shoulders and shook him violently, almost removing his cap. He shouted on David Mark, "You know we served in the army together, you know we served in the army together,” he continued, still shaking Mark’s shoulders. One other lawmaker, Aliyu Gelbi, made to hit Mark, but for members who held him tightly. “This is a shameful act; we won’t take it; we won’t allow it”, he shouted and pointed angrily at Ihedioha before he was held by some members. Members went into an executive session and discussed President Goodluck Jonathan’s request to extend the emergency rule in Borno, Yobe and Adamawa states. At the session, the members reportedly rejected Jonathan’s request outright. Briefing reporters on the outcome of the session, the House spokesman, Zakari Mohammed, said members resolved that extending the emergency rule was unnecessary because it was not working. He added that the House advised the President to rely on Section 8 of the Armed Forces Act and the 1999 Constitution to deploy troops for operational purposes. “Our resolution is no more extension; he should deploy the armed forces for operational purposes as he is empowered by relevant laws to do so,” Mohammed stated. There has been crisis in the House since Tambuwal defected from the PDP to the APC on October 28. The Inspector-General, Mr. Suleiman Abba, had also withdrawn Tambuwal’s police security personnel. Mark met with principal officers of the Senate and Ihedioha, who visited him over the development. He met his colleagues who were already protesting their maltreatment by the security operatives. Most of them said they were forced to trek a distance of about 200 metres from the main gate to their offices because they were not allowed to enter the premises with their vehicles.